Even though this has become trendy only in the last few years, I have been a huge fan of non-dairy milk for a very, very long time. I attribute part of my fantastic health to my delicious repertoire of almond, pecan, pistachio, cashew, peanut, and many other kinds of milks, that I don’t buy, but make at home instead. The last addition to this list is quinoa milk. The first time I tried it (just a few weeks ago), I soaked the quinoa overnight but did not sprout it, so I had doubts about drinking it. Could it be toxic? I lived to tell the story, but the next time I made it, I decided to sprout the seeds for a few hours first. If you don’t know this fact, sprouting seeds, grains, and legumes, usually makes them more digestible. As a bonus, sprouting the quinoa seeds also made them slightly sweet, perfect for this milk. 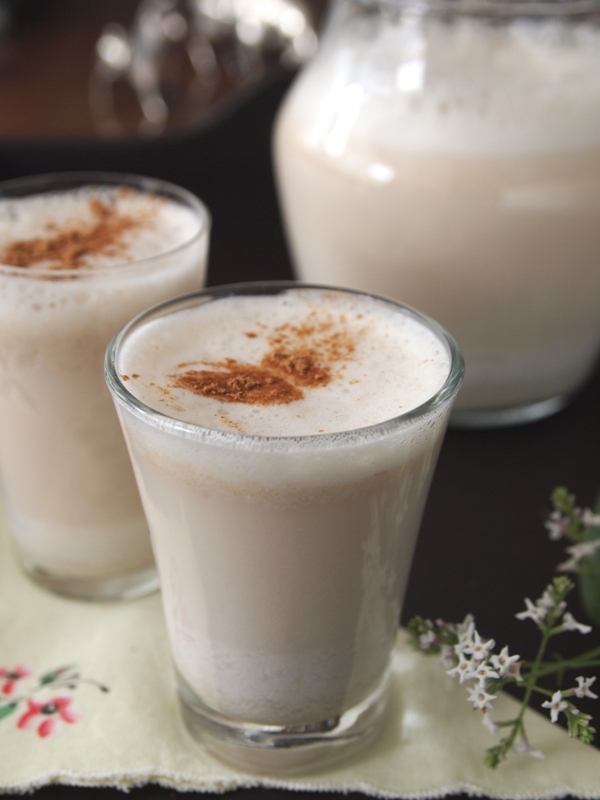 Sometimes I make my milks with plain water, but when I want something a bit more special I use spiced water, which adds a layer of flavor to the milk, and in my opinion, is quite delicious. 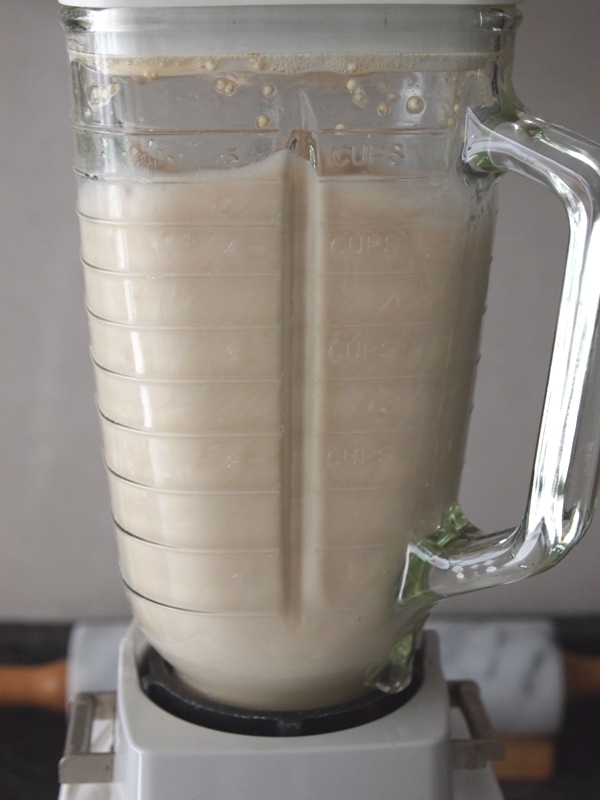 The resulting milk is slightly thick and creamy, and I don´t strain it but stir or shake it before serving instead. You may add honey -last week I added 1/2 teaspoon avocado flower honey, and it was great-, algarrobina (carob syrup), or some raw sugar. I don’t think it is really necessary, but if you have an indomitable sweet tooth, these are my suggestions. 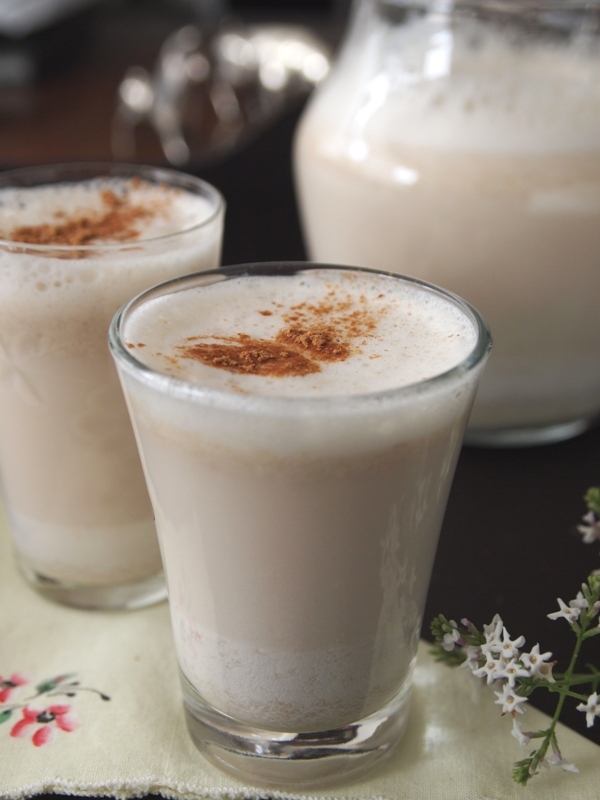 I love to have a glass of this magic potion in the morning with 1 teaspoon maca flour, because it gives me energy to start the day, or as a mid-morning pick me up. 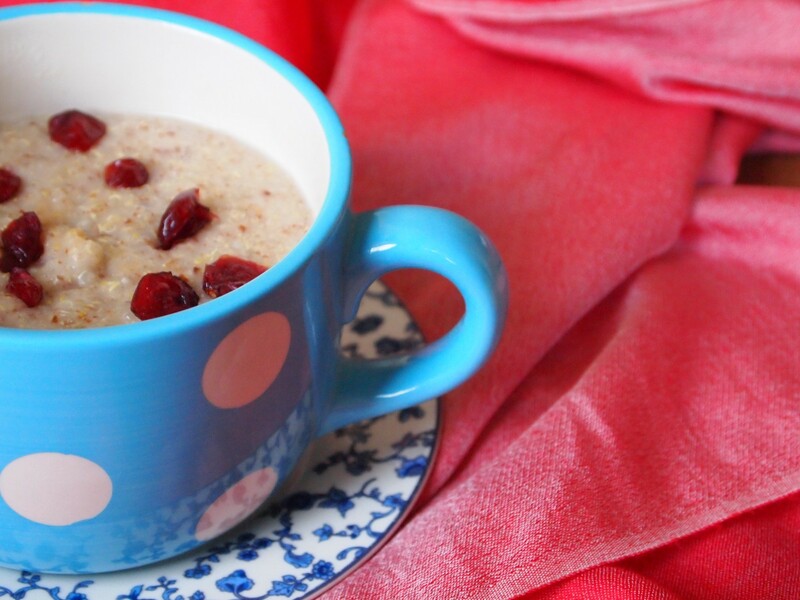 It´s also wonderful with oatmeal, but I try to add it at the end, instead of cooking the oats in it, because I like to keep it raw to get as many healthy quinoa nutrients as I can. Sprouts in particular are full of living enzymes, so I like to make the most of them, instead of killing them in the pan. Wash quinoa and put in a bowl. Cover with water and soak for several hours (4-5). Drain the water, place quinoa in a colander and let dry overnight, covered with a kitchen cloth. The next day, combine the spices -except vanilla and ground cinnamon- in a saucepan, add two cups water and bring to a boil over medium heat. Boil for 5 minutes, turn off the heat and cool to room temperature. Strain and discard the spices. 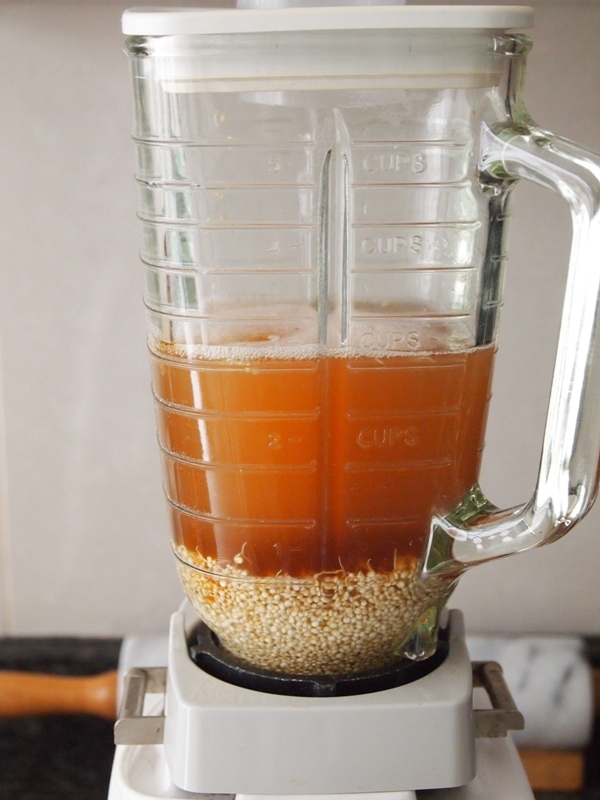 Put the sprouted quinoa in the blender, add the spiced water and vanilla, and process until smooth. Pour in a jar and keep refrigerated up to two days. To serve sprinkle the top of the milk with ground cinnamon. I am so proud of the two Morenas! Girls, keep shinning with your Peruvian recipes. I can hardly wait to try some of those delicious and healthy recipes you are sharing with us. I am also Peruvian and I love to cook. I also have a cookbook (Maya’s Secrets), and a cooking show on youtube. All of those are more reasons why I am so proud of the two of you, because I know how much work it takes to create recipes, test them and publish them. I am really proud for you! Hi Maya, thanks for your lovely words! Can´t wait to read your book, where can I buy it? Hi Paulina. 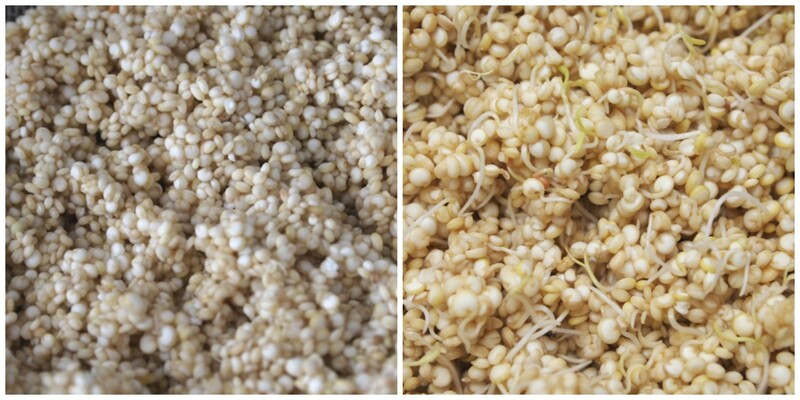 Sprouted quinoa milk is made with raw quinoa, that´s why you need to soak it, but sometimes I have made it with raw and unsprouted quinoa. If you rather cook it first, by all means do it. Quinoa milk is very nourishing. Thank you so much, this is exactly the recipe I was looking for. 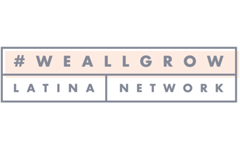 Dr Furhman – a remarkable nutritionist recommends soaking the quinoa or any grains overnight so they can release their powerhouse of nutrients. I love this recipe because the most important nutrients in the quinoa won’t get destroyed or wasted with heat. Glad you liked it! We’re big fans of Dr. Furhman too. I just made this wonderful milk. I let the quinoa soak overnight added coconut water and blended at high speed. I thought I would have to strain it but “no!” not at all. I then added a bit more water. It was great! I will try other variations but I don’t really need to. Thanks so much. It has a nice flavor too.